Description Fit a polynomial to amplitudes extracted along a horizon. Extract amplitudes from a gather volume along a 4D horizon (i.e. IL/CL/gather dimension) and fit a polynomial to the extracted values. One map property is generated for each of the polynomial coefficients. For each location, amplitudes are extracted from the gathers along the horizon. Using the least squares method, a polynomial of the specified order is calculated for the amplitude sequence. Each of the polynomial coefficients is stored as a map property in the original gather horizon. With two terms, the polynomial coefficients are analogous to I/G, but not the same. In this process, the independent variable (x) for the polynomial is linear in the gather domain (dependent on the gather type: angle or offset). For intercept and gradient, the independent variable is (sin2(x)) where x is the angle. In the Details Panel of the process, select a Gather horizon and Gather volume. Define the Polynomial order to fit at each location at which the volume is defined. As a result, a separate horizon property will be produced for each polynomial order, attached to the selected input horizon. 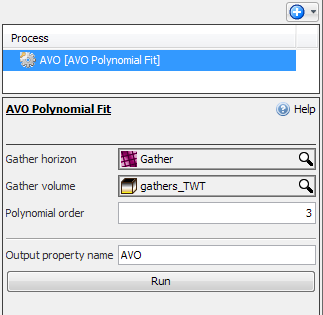 At Output property name, type a name for the output horizon property that will be created. 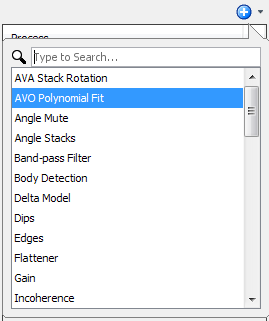 Right click on the horizon used for the AVO Polynomial Fit process and select Manage Custom Properties. The Custom Properties window will be displayed. 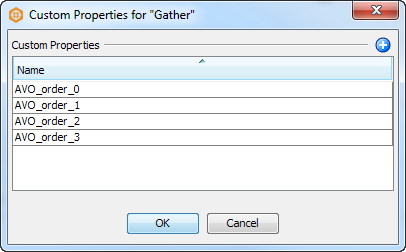 Sort the order of the custom properties in alphabetical order by clicking on the header. The properties can also be renamed by clicking on the name and typing in a new name. Click OK to save and close the custom properties. For more information, see Custom Horizon Properties.